Each day hundreds of businesses are victims of check fraud and counterfeiting. Companies are also fearing measurable financial losses due to counterfeiting business documents beyond checks. Technology today can provide almost anyone the tools necessary to fraudulently duplicate and manipulate checks and confidential documents. In addition to physical tampering, color copiers, PC's and scanners are now the counterfeiters' weapons of choice. In today's business world it takes only one document, the right technology and one criminal mind to rob any business of thousands of dollars. While no one has the exact figures, experts agree that document fraud has at least tripled during the past two years. Worldwide, 80 billion checks exchange hands annually; 60 billion of those are written in the U.S.
More than 1.2 million worthless checks are accepted for payment each day. Counterfeit checks are the fastest growing source of fraudulent checks due to advances in color copying and desktop publishing capabilities. The FBI estimates that if commercial banks and other institutions combined their check fraud losses, the total would be $12 billion to $15 billion annually. A recent survey of more than 2,000 large U.S. corporations concluded that, on average, they lost approximately $360,000 a year due to check fraud. U.S. retailers place losses at $750 million through the illegal copying and redemtion of fake coupons and gift certificates as well as an additional $700 million for altered or duplicated cash register receipts. The U.S. Government Accounting Office reportedly paid $28 billion in benefits to individuals who used counterfeit identifications (birth certificates, social security cards, and drivers licenses) to defraud various social service programs. Type printed so small that it appears to be a solid line and can only be read under magnification. When copied or scanned, the microprint message becomes unreadable. Warning borders alert the recipient of a document that there are security features present. Some security papers come with the feature which creates a "stain" when persons try to use bleach agents to change information contained on the document. Certain papers also contain "multi-language" verbiage that appears upon bleaching also. Void pantographs are patented processes that force a hidden word to appear when photocopied or scanned. This pantograph works in specific ink colors on a majority of color and black and white copiers and scanners. Watermarks are a very effective method of verifying that a document is an original. 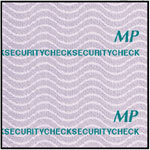 Security papers are available with artificial and true watermarks. Custom artificial watermarks can be printed with your logo or name. The red arabic numbers on continuous checks and forms will bleed through to the back of the document thus verifying it's authenticity. It is not available on laser cut sheet products. When copying our Security Screened Backer the words "Original Document" will drop out. This backer also complies with the Federal Reserve Regulation CC. Some security papers come with invisible fibers that only appear under a black light.